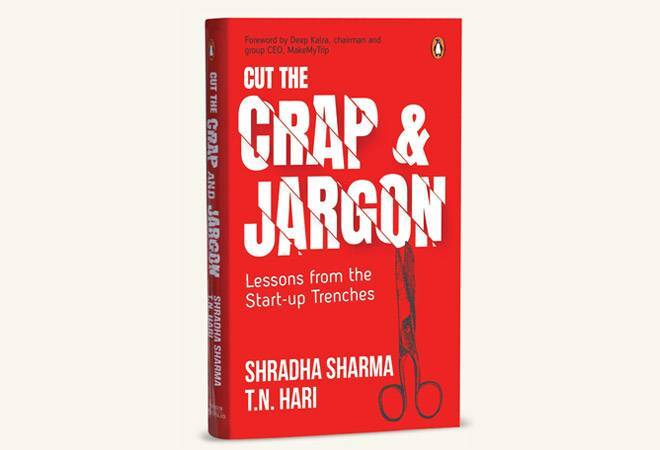 CUT THE CRAP AND JARGON, is a take by Shradha Sharma and T. N. Hari aimed at providing lessons from the start-up trenches to young entrepreneurs. It recognises the uniqueness of start-ups relative to more mature companies, in terms of uncertainties and dynamism that characterise a start-up's operating environment. It has an interesting mix of entrepreneurs' personal experiences, expert views and theoretical construct around management. The book shines when Sharma speaks from her experience. Her fundraising story stands out as an illustration of an entrepreneur's quest and her dilemmas, as also the battle against disbelief that most external parties approach a start-up with. She explains clearly the importance of raising money for the right reasons, as well as the humility required not just to raise money, but in everything one does as an entrepreneur. Similarly, her piece on 'nuts and bolts of hiring' is instructive and practical. The authors have also done a good job in bringing advice from experienced entrepreneurs, especially Sanjeev (Aggarwal, Co-founder of Helion Ventures) and Bala (Srinivasa, MD, Unitary Helion), to the table. Their ability to distil start-up execution into actionable steps will help entrepreneurs get the basics right. Hiring a head of sales is one of the trickiest jobs in scaling a start-up, especially in the B2B domain, and Bala provides a practical guide to key considerations in this process. Sanjeev offers good guidance around driving execution to move towards a high performance start-up. Beyond these gems, the book really meanders. Often, it fails to focus on its core audience - the start-up entrepreneur. It starts to enumerate examples and commentaries that are irrelevant to her - instances of global leaders scheduling conference calls and debates on whether Softbank will make money for its LPs are unlikely to be useful to most Indian entrepreneurs. Very often, the authors delve deep into what managers need to do to be effective - MRMs and all. Those topics are start-up -neutral and much better dealt with in other books. Some other chapters like the one on data science are also not specific to the start-up context. Finally, the book fails to keep up its promise of cutting the jargon as it falls back onto "five habits", "FOMO", quotes from HBR, and advising entrepreneurs to "consult extensively with local leaders and influencers". You can find some real learnings if you hunt for it. These appear especially on account of the real experiences brought to the fore in the book. Feel free to gloss over the large sections though, as you prioritise your time to focus on the most important task at hand - building your company.